6. Helps you to score better than lakhs of students. 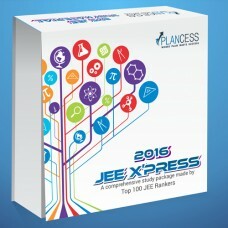 Plancess Study Material is a comprehensive package for the preparation of JEE Main & Advanced which is designed by Top 100 IIT-JEE Rankers and Senior Faculty of Premier Institutes. It covers complete JEE syllabus in 86 topics of Physics, Chemistry and Mathematics which are available in 86 ebooks(USB) . 4. 5000+ Illustrations and Solved Examples and also 9000+ Unsolved Questions covering entire material. 6.Six Level of Exercises categorized into JEE Main & Advanced and also categorized some questions as Plancessential Questions in revision. 7. Seven types of Questions based on latest JEE pattern and also a formlua sheet for each and every topic. 3.There are 172 test of series including chapters and subject wise tests. 5. Plethora of questions that gives good practice as per latest JEE pattern. a. Foundations Level or Theory: Extensive and chapter-wise Theory + solved questions to develop basic understanding. b. Advanced Level Or Questions : Conceptual and Tricky questions solved to provide deeper insight. 7.Exhaustive Pool of Online Resources 8.Rank generated for all tests. 5.Achieve success by accessing the knowledge of Top Rank holders that made them top in IIT 6.Get complete Access to IIT JEE rank holders Tips and Tricks in JEE preparation. 7.Helps you in mastering your problem solving and Prepares you for every pattern which IIT has adopted and all formula sheets are provide for quick revision in the end. 1.Two 32 GB Pen Drives consisting of video lectures covering 11th and 12th syllabus for PCM. Valid till 30th June 2016. 2. 18 books will be provided which covers 89 topics of both 11th and 12th class. 3. Online Subscription to the Plancess Test Series at Plancessjee.com. Valid till 30th June 2016. 4. A dedicated IITian mentor to solve generic/non-technical doubts.